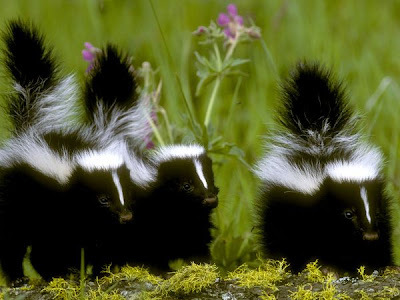 Mindless Mirth: SKUNKS!!!!... 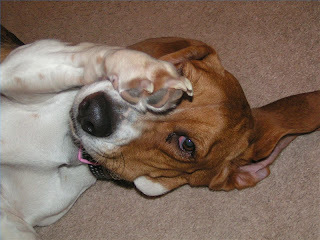 OH NO, It's MY DOG!!! It's midnight, and I've just returned home from a concert. Cindy (my girlfriend) couldn't make the show so she's all cozy in bed with our three Beagle mixes. She mumbles, the dogs probably want out, so I call all three to the back door. A minute later, I hear baying, like at least one of the three, usually Nutmeg, has found a critter. I grab the flashlight and my shoes and go out to quiet her and bring them all in before the neighbors get annoyed. My plan is instantly transformed into a slow motion nightmare as the beam of my light shows all three of the pups in hot pursuit of A SKUNK! It's just a very small skunk, but before I can do anything about the situation, all three dogs and myself are engulfed by a smell which at a distance isn't all that bad, but up close and personal is horrific! It's the only smell I know of that saturates every pore, and then lingers with a vengeance. I run to the back door, all three dogs being led by their collars in tow, and shout (in my best Ozzy voice), "CINDY! Come quick! The dogs got skunked"! Cindy after all is a vet tech and knows what to do in these situations. She jumps into action and whips up a remedy that REALLY DOES WORK. 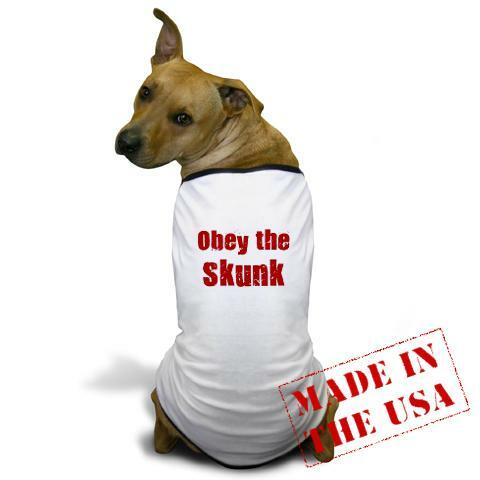 Yes there is a lingering skunk odor which will be in the house for a week or more, but the dogs are all INSIDE and sleeping soundly only 1 hour after the incident with 90% of the smell eliminated from their coats. I was amazed, so I thought I should share it here, in case you ever experience the same misfortune. Wet the dog, and work the formula through their fur. and then rinse thoroughly. Throw out any leftover remedy. This post was written DIRECTLY after the incident. The dogs still have a very slight odor, but I'm sure this will wear off, or I'll become used to it, soon enough.